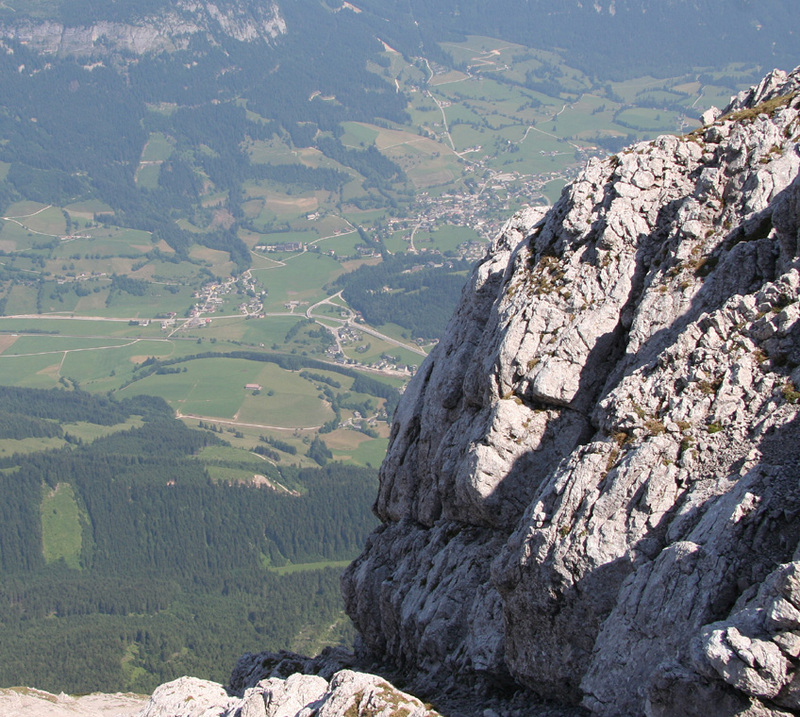 How to get there: Just before you get to Bad Ischl (on Hwy. 158), you enter a tunnel. Immediately after exiting this tunnel, take the second exit right. This will get you on to Hwy. 145 (south). The signs says Gosau and Graz. From the end of this tunnel, drive 55 kilometer along Hwy. 145. You will pass Bad Aussee and at the end, hit Hwy. 146. Make a right turn onto Hwy. 146 (direction Salzburg) and drive exactly 3 kilometer. There are a few houses on your right and a small turnout with parking on your left. A text on the small structure next to the parking says "Parking for the Grimminghütte". Park here, this is the trailhead, elevation 655 meter, location N47:30.444 E014:02.966. Note: The above route was my approach from the small village of Strobl. 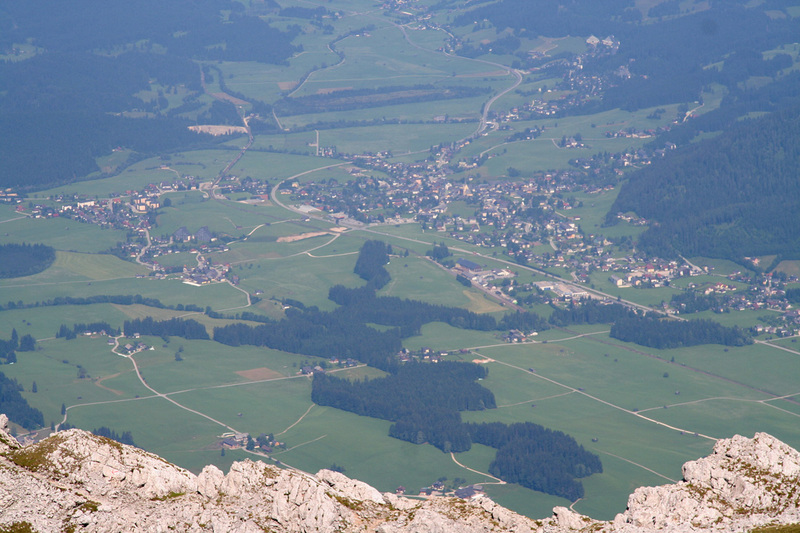 From Salzburg, it is likely better to drive A-10 south, then (near Radstadt) to take Hwy. 146 east. You will then arrive from the opposite direction, but this should not cause any difficulties. 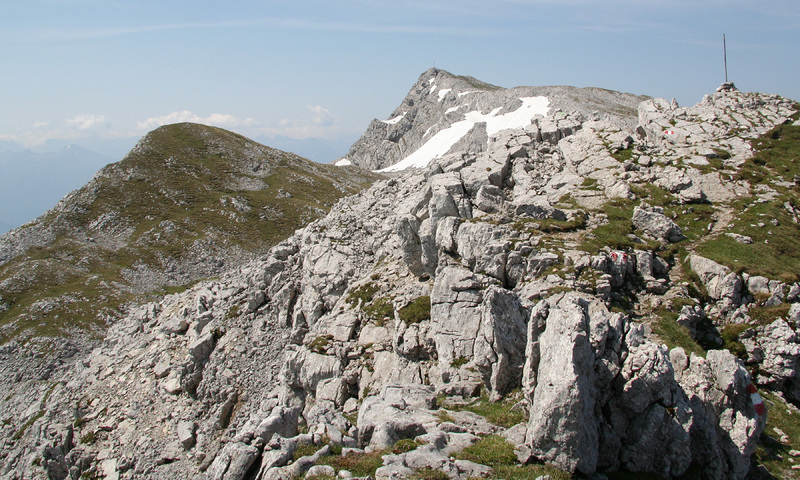 Route description: There are three common routes to this summit. The first (and easiest) starts up the ski-jump hill in Kulm on the north side, the two others start from the trailhead described here. From this trailhead, cross the road and head up the small road among the houses. As soon as you cross the creek, the trail goes left. 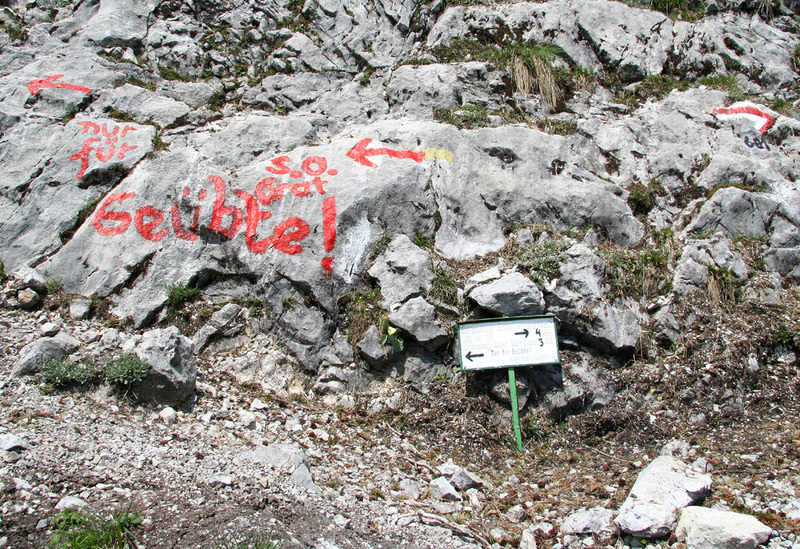 There are numerous yellow signs pointing to the Grimminghütte, one cannot get lost. The time estimates on these signs are generous, stipulating a full hour up to the hut. Soon, you enter a horizontal forest road that you follow left until you arrive at the Grimminghütte. From the hut, head into the forest, then gradually upwards to a clearing. 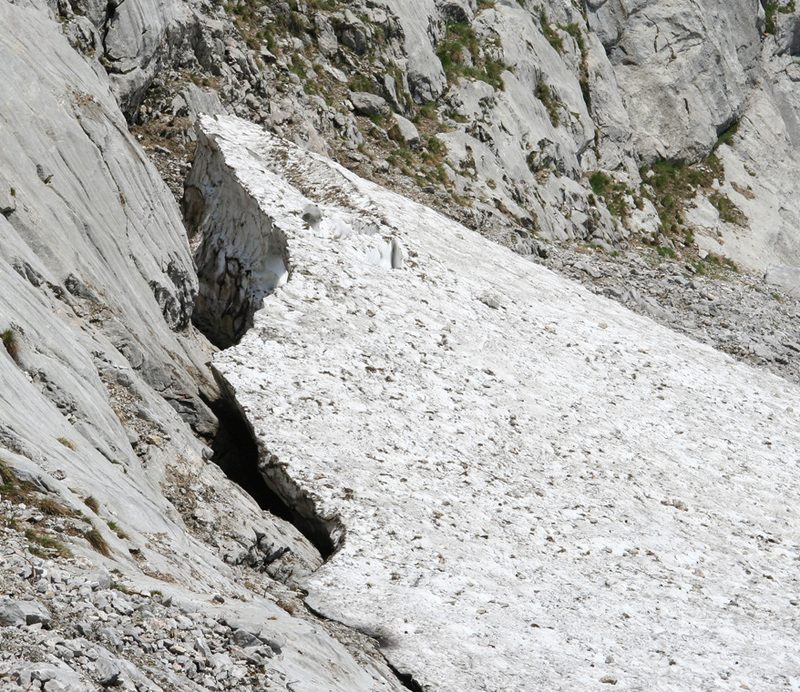 From here, the trail climbs steeply in a gully. There is a ladder at the bottom, but it is easy to climb on the left side of the ladder. 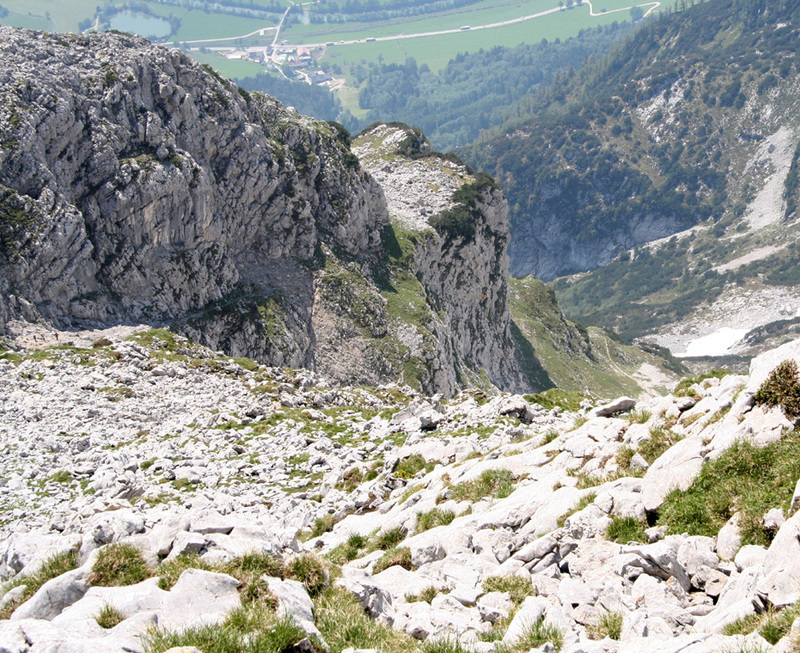 Beyond the top of this slope you climb more gently to a rockface where the trail forks. 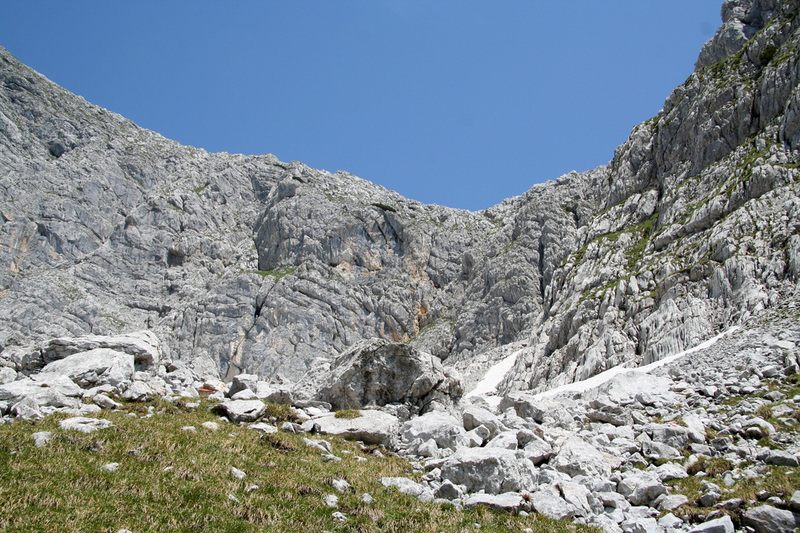 The left route climbs the south-east ridge. 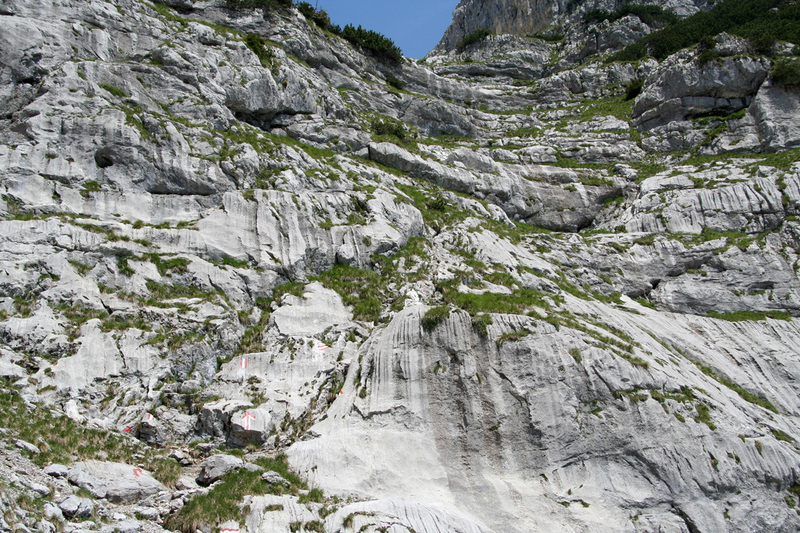 This is a climbing route (no cables) of relatively low difficulty. 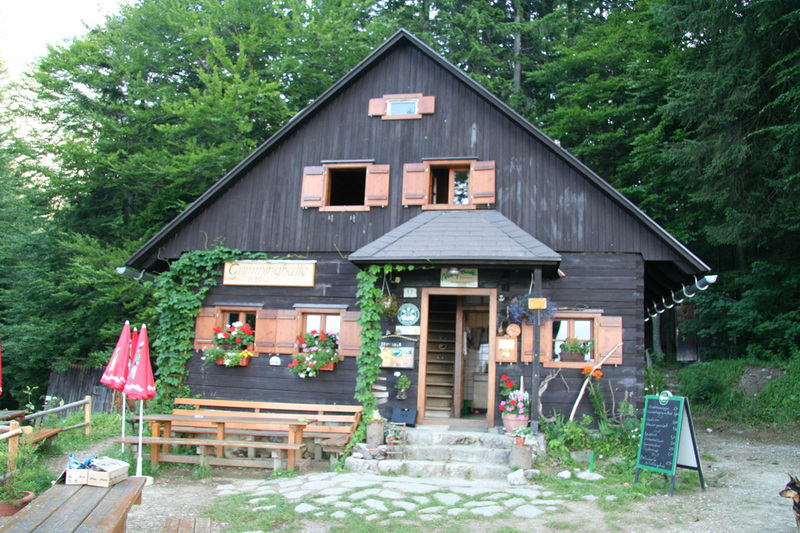 (The girl in the Grimminghütte said UIAA II+.) The hiking trail forks right. 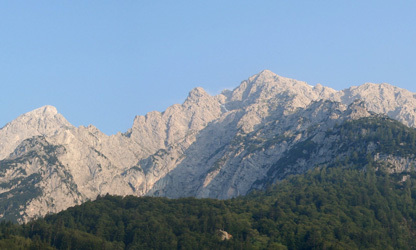 The elevation is 1397 meter and the location is N47:31.338 E014:02.046. Higher up, traverse some loose slopes followed by a sharp right turn. The trail climbs steeply from here up into a basin higher up. There are cables on the steeper sections. 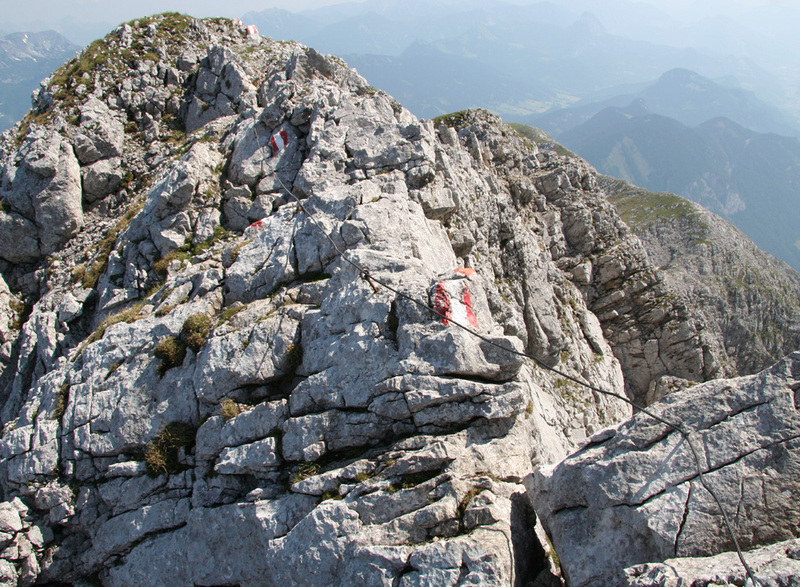 The climbing difficulty corresponds to YDS class 3, one can climb this route without making use of the cable. From the basin, the route climbs via a nice ledge to the ridge above, then follows this broad ridge to Multereck, the end of a grassy ridge. Elevation 2179, location N47:31.718 E014:01.642. 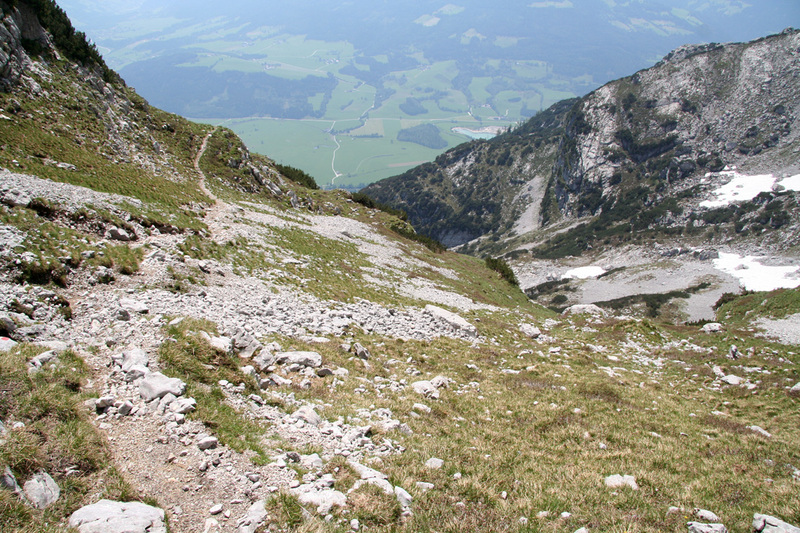 From Multereck, the trail runs more along the ridge, there are a few small descents and a few gentle uphills. The trail is slightly narrow with some exposure in a couple of sections. 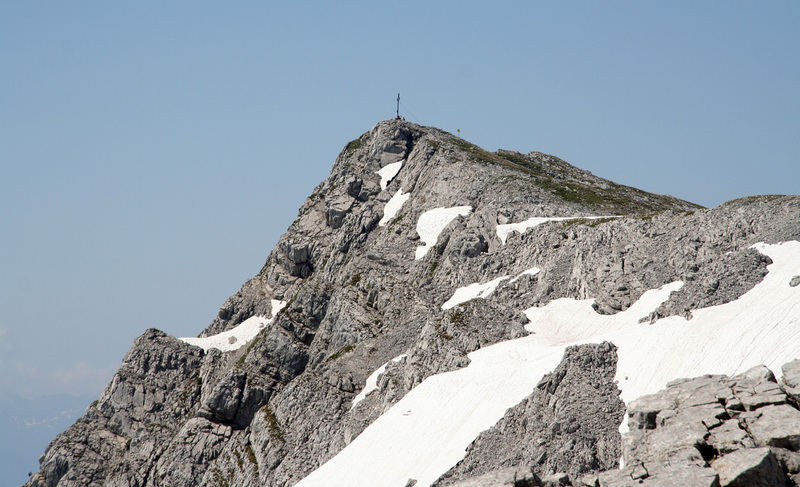 The summit appears ever closer, before a final, gentle slope brings you to the summit cross. Comments: I climbed this mountain solo. The distance (straight line) from the trailhead to the summit is 2800 meter with a vertical change of 1700 meter. This mountain looks steep already from the parking area! You do easily get an airplane feeling on this peak. It rises steeply from the vallys surronding it. I started hiking at 0645, arrived at the Grimminghütte in 0:30 at 0715, had breakfast until 0740, and arrived at the summit at 1010. Taking into account that this route was steep with a lot of class 3 scrambling I was quite happy with a (net) time of 3 hours from the car to the summit. After 20 minutes with nice views all around and after having signed the summit log, I descended back down to the Grimminghütte in 2:15. There I enjoyed two glasses of juice and one glass of beer while resting until 1300. The final descent took 20 minutes and I arrived at the car at 1320. Grimming as seen from the trailhead. Grimminghütte where I had breakfast. The trailfork. 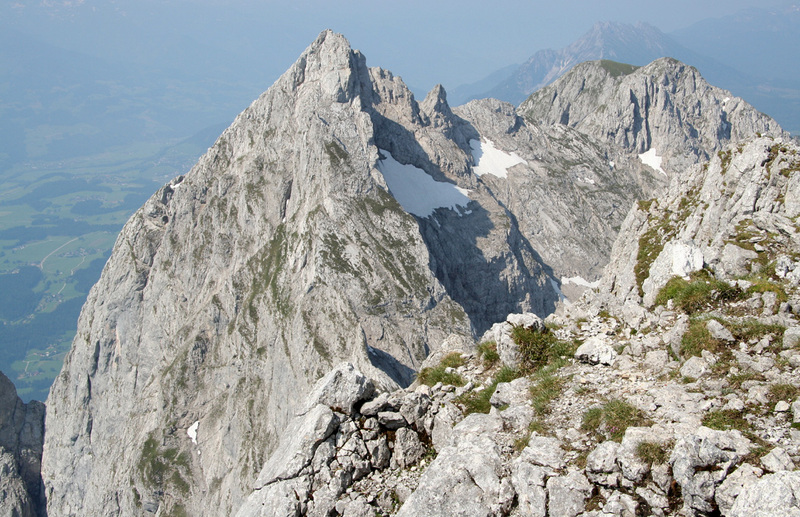 Left is the climbing route on the south-east ridge, right is the hiking route via Multereck. Hard snow, boots and/or an axe had been nice here. Up here!The route climbs to the blue sky here. This was the steepest part, much steeper than it looks in the picture. Continue up here, easier than it looks, a ledge further right is key. A look back down, one can see the ledge. The summit comes into view. 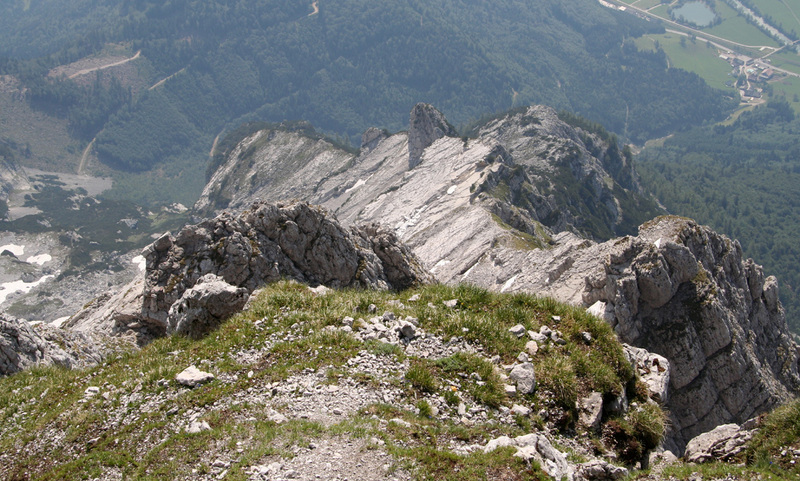 The route is less steep, but has a few narrow spots. Summit view. 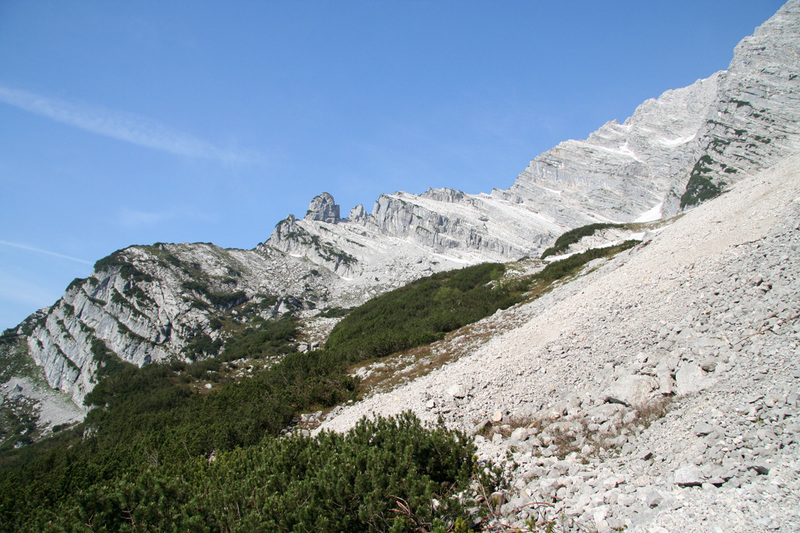 North-East, Totesgebirge, highest is Grosser Priel. There was too much haze for good views. 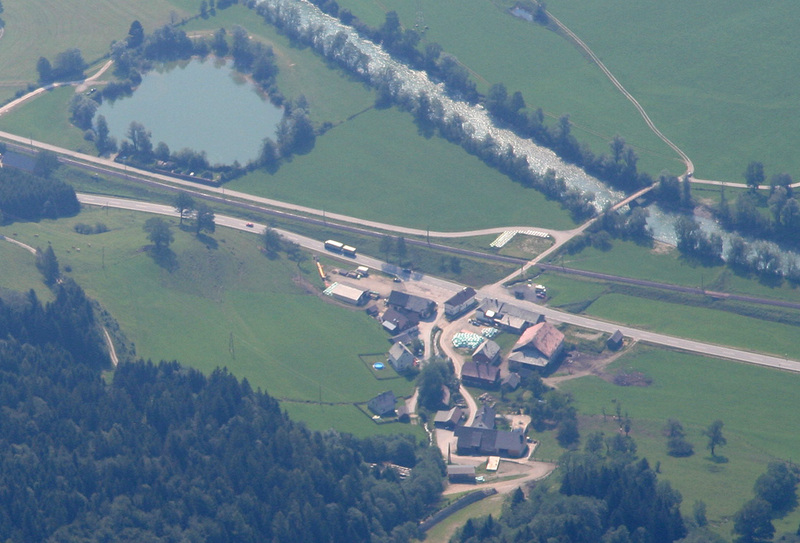 Summit view north, the village of Tauplitz. The south-east ridge, seen from the summit. The trailhead, seen from the summit.